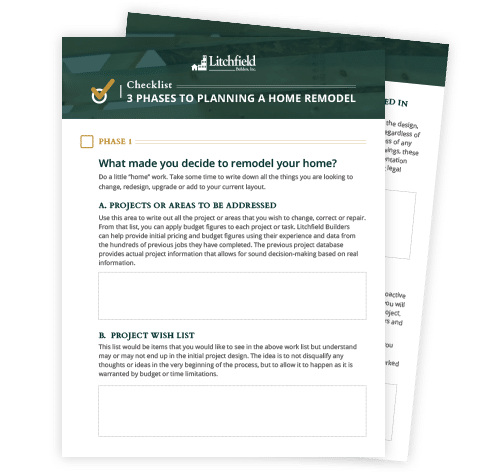 Download Your Free Home Remodeling Checklist! Make Your Remodeling Project a Success. The key to a great home remodeling project is proper planning. However, with all the craziness that comes with a home remodel, it's easy to overlook important steps you need to take. With this checklist, you'll be sure every detail is accounted for before you begin construction, giving you peace of mind that your project will be a success. Tips to help you figure out exactly what you want out of your home remodel. How to lock down how you'll execute your project - from hiring, to budgeting, to the documents you'll need. What factors to consider when choosing a contractor. Download this free guide and get started planning the home remodel of your dreams today!